Whether you think the problem is minor or not, water damage should be cleanup with immediately by a professional because it can spread quickly through absorbent materials to cause extensive structural damage and even mold growth. Water damage can be caused by several different internal and external factors in a home or building and it can also spread to hidden areas which makes it important to call a professional. ServiceMaster 24 Hour provides water damage restoration / water damage cleanup services to remove excess water from homes and buildings in Largo, FL as well as dry and repair water damaged structures and furnishings. We will remove the excess water to help prevent any further damage and find and remove excess water from hidden areas. Within minutes: Rusting of metal begins including nails and screws. Within hours: Plywood delaminates, carpeting stains, particle board buckles, dyes from wall coverings and rugs will transfer to other objects, and furniture splits, cracks, and warps. Within days: Mold and mildew appear along with musty odors and electronic components corrode. Initial Assessment: We do a complete evaluation of the damage to determine the scope and the cause of the problem and create a restoration plan based on our assessment. We will provide you with a copy or our assessment. Advanced Equipment: Our cleaning products can effectively clean up water damage including mold and mildew and we use advanced drying equipment that includes air movers and dehumidifiers. Thorough Drying: We can thoroughly dry the structural elements, furnishings, wall cavities, and other spaces in your home with our drying equipment. Deodorization: We can remove lingering odors from the excess water or mold growth. As soon as you discover water damage in your home or office, contact ServiceMaster 24 Hour immediately to restore the damage with our water damage restoration / water damage cleanup services. 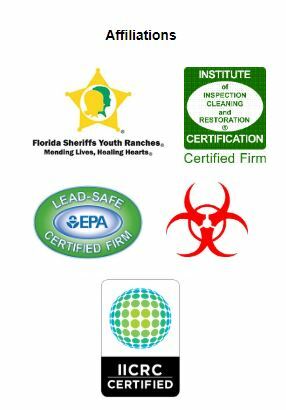 We can remove excess water from homes and buildings in Largo, FL and we will repair the source of the damage to prevent it from happening again.